The link speed may be reported as 10mbit, instead of Gigabit. The actual data throughput may be even slower than 10mbit, with speeds of only a few KB a second actually being transferred. This problem has been send on the Intel Server board S2600IP4 which includes four Intel I350 connections. This appears to be a driver issue and has been found in driver version 18.3 through to version 20.1 (June 2015). Disabling advanced ethernet options such as support for Energy Efficient Ethernet (EEE) has no improvement. This issue has only been observed in Windows 7 but likely applies to Windows Server 2008R2. Disable TCP/IP v4 Large Send Offload V2. 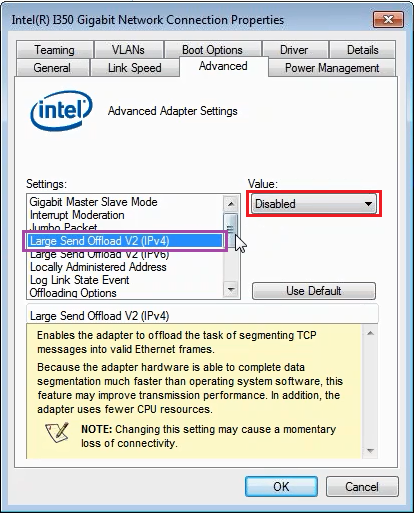 Find Large Send Offload V2 (IPV4) in the list. Ensure you do this to all adapters in the system, especially if you are using any network teams. The adapter may briefly stop transmitting or receiving whilst you make this change. Stone Server and Workstation Products that include the Intel i350 Gigabit LAN Adapter running Windows 7 or Windows Server 2008R2.